Size rules the roost in the HVAC industry. It is important in all aspects of HVAC system be it size of the cooling unit or size of the ducts, which will take cool air from the AC to you. 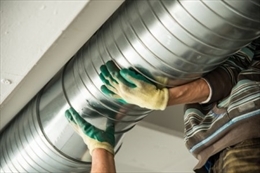 If you are going to install a completely new central unit in your house, be sure that your ducts are sized properly according to the design of your house. A poorly sized duct will compromise your comfort level as well as ruin your machine. On the top it you will pay exorbitant power bills at the end of each month. A poorly sized duct will not allow smooth air flow. There are precise sizing methods that a reused by HVAC contractors to design the duct of a house. Knowing air flow needs- A central AC circulates air in multiple rooms of a house through the ducts. All rooms will not need the same airflow. Therefore the sizing methods have to be used to optimize the airflow that will vary from room to room. Dampening the noise –Noise is a common factor that is often complained of by HVAC users. The noise in most cases is caused by movement of air.The duct designers have to make adjustments to bring the acoustic issue sat the minimum level. There are various noise reducing materials available. Sealing the system – Leaks are one of the prime factors that compromises the efficiency of a HVAC unit. Almost 20% of the conditioned air leaks into your surroundings. This disables you from getting proper cooling. Your utility bill leaps up. So a duct designer should always closely monitor for leaks in the airway system. Insulating where necessary – The ducts also run in the unconditioned zones of the house such as attic, basement etc.A good amount of energy is lost in these zones if they are not insulated properly. So duct insulation is crucial to reduce losses from conduction. Room by room load calculation is important otherwise the room temperature will become very uneven later. •	Next, the friction rate is calculated. This is done by knowing the external static pressure of the blower by following the specifications of the manufacturer. The temperature drop that is generated by adding components in the duct way is deducted from the static pressure. The result is the available static pressure of the duct system. The entire length of the duct is calculated which incorporates the total run from the farthest supply outlet through the equipment to the farthest return outlet plus the equivalent lengths of all turns and fittings.Now the friction is calculated. •	Now the duct size is calculated on the basis of the friction chart or duct size calculator. Besides this there are other considerations that are taken into account when calculating duct size. The size of the duct depends on the type of cooling system that your house has. For instance, if you have a heat pump you will need larger ducts than forced air systems. Heat pumps produce constant and even flow of air. The forced air systems give short but strong blasts of cooled air. 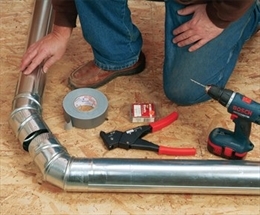 Why duct sizing is important? Most of the time we do not realize the importance of air ways that run from our AC to the registers fitted in your rooms. Being hidden in walls and running through attics and basements they remain out of our sight. But if your ducts are infested with leaks, bad connections, or poor construction or it is not sized properly, it can have a large negative impact on your AC. If your ducts are too large you will face the consequences right away! You will encounter noises coming out of the chute due to restriction in airflow. This will lead to uneven cooling of rooms. If the ducts are too small it will result in high energy bills, poor humidity control, and even show “dirt” streaks coming from the air conditioning grills.According to studies an improperly sized duct work can lead to 60% loss in efficiency. It can also mean an early retreat for your HVAC and the expenditure of purchasing a new one.